After the bombshell that UFC 151 was cancelled, UFC officials were on overdrive Thursday, trying to arrange fights for all of its fighters. Earlier today, the UFC announced that UFC 151’s co-main event fighters Jake “The Juggernaut” Ellenberger (27-6) and Jay “Thoroughbred” Hieron (23-5) will be moved to UFC on FX 5. UFC on FX 5 will take place at the Target Center in Minneapolis on Oct. 5 and features heavyweights Travis Browne and Antonio “Bigfoot” Silva in the main event. Ellenberger and Hieron met once before back in the IFL in 2006, where Hieron earned a unanimous decision over Ellenberger. Since the IFL, Ellenberger has gone on to becoming a marquee name in the UFC’s welterweight division and has gone 6-2 in the Octagon. The Juggernaut put himself at the top of the heap after emerging victorious over the likes of Jake Shields and Diego Sanchez. Hieron returns to the Octagon after having gone 9-1 in his last 10 bouts, including winning Bellator’s Season 4 welterweight tournament. His lone loss was a highly contested split-decision to Bellator welterweight champion Ben Askren. After the Askren loss, Hieron got back on the horse and rebounded with a thrilling second round submission victory over Romario Manoel da Silva at Legacy FC 12 in July. 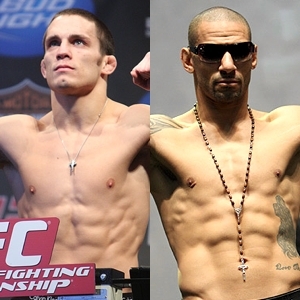 Check out MMAWeekly.com’s UFC on FX 5 rumor page for more on the fight card.